Europe’s leading low cost airline slashed its profit forecast for the current fiscal year to between €1.1 billion ($1.27 billion) and €1.2 billion ($1.39 billion). That’s about €150 million ($174 million) less than the company had expected. 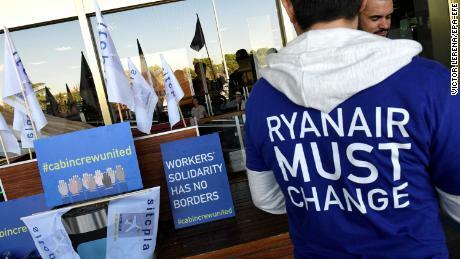 Ryanair (RYAAY) said that strikes and flight cancellations in September had resulted in lower traffic and higher costs. It warned that customer fears of further cancellations had led to reduced bookings, forcing the airline to cut fares in the third quarter. Shares in Ryanair dropped over 10% in London, leaving the stock down more than 22% so far this year. The company said it could slash its profit guidance further if the strikes continue. A sharp rise in fuel costs has also heaped pressure on the airline and its outspoken CEO Michael O’Leary, who is confronting labor unions after staff strikes forced the cancellation of hundreds of flights in recent months. Ryanair first recognized unions in December 2017 and has since struck labor agreements with pilots in Ireland and Italy. It has yet to reach agreements with union officials in countries such as Spain, Portugal, Germany and Belgium. A turning point for low-cost airlines? Over the long run, labor disputes, shrinking profit margins and rising customer dissatisfaction could undermine the business model that made Ryanair the largest airline in Europe, with 13,000 employees and a fleet of 430 aircraft. Rival budget carrier EasyJet (ESYJY) said Friday it was gaining business because of Ryanair’s troubles. But it too gave a cautious outlook about its earnings because of increased fuel costs and pay deals for staff. The analysts said that earnings at traditional carriers — such as Lufthansa (DLAKY) and British Airways — would be less affected by rising fuel costs, making them more attractive to investors. The tougher climate is now forcing Ryanair to scale back. The company said Monday that it would close bases at Eindhoven in the Netherlands, and Bremen and Niederrhein in Germany on November 5. It said that affected pilots would likely be offered other positions and it would seek to minimize job losses among cabin crew.